With awards season concluding at the end of February, many critics are sharing their top then lists and the Movie Sleuth is no exception. What follows are Kyle Jonathan's top ten favorite films of 2018 and some honorable mentions. Lynne Ramsey's lightning paced rumination on PTSD is a violent fable that explores loss and isolation. Featuring the greatest performance of Joaquin Phoenix's career and one of the most heartbreaking, unexpected scenes of the year, this is a film that is sure to achieve cult status in years to come. Easily Shrader's best film and inarguably Hawke's greatest performance, this is a tempest of art house sensibility and lamentations for neo-American society. Somber in its presentation, dangerous in its revelations, this is an unparalleled cinematic experience. Hereditary is a malefic triumph, not of the soul, but of the psyche; a terrible, profane mutation of the ritual of consuming cinema. Expectations are exploited, mutilated, and ultimately obliterated under Aster's masterful command, the yield of which is something unexpectedly terrifying and undeniably important. If slow burn, no mercy horror films are something you enjoy, this is the film for you, however, be warned. Once you invite Aster and his astonishing cast and crew into your mind, there is no escape. The dark in this tale is the unthinkable capabilities of the human race. Underneath social mores and theological doctrines lies base, animalistic behaviors. While some choose to embrace them, eschewing any sense of belonging and attachment, others cling to their families, communities, and personal ideals for respite from the dark. 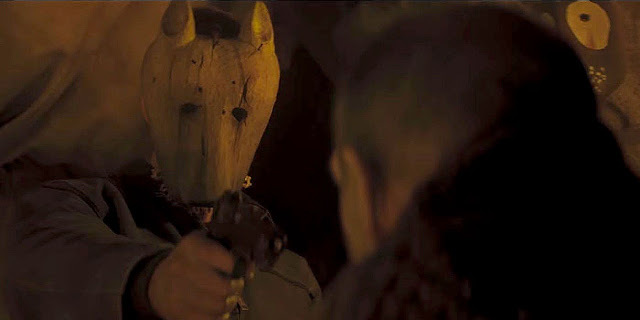 In Jeremy Saulnier's latest, the darkness is very real, and like the wolves who are plaguing his protagonist, it is waiting just beyond the door of sanity to devour any who tread outside. Madness is the medium and flesh is the canvas during the bulk of Tokyo Vampire Hotel and genre fans will find much to adore as they allow Sion Sono to draw them into an insular world of immortal hatred and vague prophecy. The conclusion pulls the viewer from the depths of limbo into the world beyond, reminding one of the power of perception and the inherent dangers of the worlds we design around ourselves, hoping to keep the darkness at bay. Sono is here to remind everyone, that the darkness is already within us. The Favourite is an extraordinary artistic experience. Combining everything Yorgos Lanthimos is loved (and hated) for with three once in a lifetime performances yields one of the most powerful films of the year. Darkly funny, profane, and absolutely merciless, this one is not to be missed, both by casual movie goers and the most studied film lovers. Where to View: Currently still in theaters. Lars Von Triers' brutal self-critique is a vulnerable masterwork that turns the mirror upon its creator, the end result of which is one of the bravest films ever conceived. Featuring a career best Matt Dillon as the eponymous serial killer, what follows is a movie by movie take down of LVT's controversial filmography, in which each film is symbolized by a brutal murder. One of the most courageous and fascinating works of the century. Suspiria is truly special cinematic gift. Most certainly not for everyone, this is a brooding, slow paced descent into the bowels of a personal hell unlike anything ever committed to the screen. Beyond this crucible is an angelic ascent, an embrace of the light that exists within each of us. It is here, amidst the ruins of the flesh, that Luca Guadagnino once again reminds us that he is one of the most talented artists working today. A lewd triumph in a time where safe, predictable choices dominate mainstream cinema, this is a film that will repulse many and this is part of its abrasive charm. The wonder of this film is in how it explores the divine importance of events that would otherwise be relegated to a Walmart five-dollar bin. Fate and even the gods themselves are always at play in Cattet and Forzani's strange and frightening universe and Let the Corpses Tan is their crown jewel. Mandy is a pitch-black opus of psychedelic madness. It is a film that will undoubtedly repulse viewers looking for any sense of a traditional viewing experience, however, those looking for something utterly unique will find much to treasure. A poisoned love letter to a decade out of time that is also one of the most honest films about love and loss ever conceived, Mandy is a masterpiece and one of the finest films of the century. 2018 was an outstanding year for cinema. Beyond the top ten, there were dozens of solid entries, such as the Coen brothers’ nihilistic takedown of the American west, The Ballad of Buster Scruggs (Netflix) and Benson and Moorehead's Lovecraftian sequel The Endless (Rental). Joseph Kahn’s social justice takedown Bodied (Youtube Red) and Coralie Forgeat’s stellar Revenge (Rental) present two of the year’s most social relevant offerings, while The Wild Boys(Rental), Virginia Beach Native Leonardo Warner’s Madhouse Mecca(Rental), Bad Times at the El Royale(Rental), BlacKKKlansman(Rental), Apostle(Netflix), and Upgrade(Rental) offer a plethora of unique cinematic experiences.